It was an emotional drive leaving Atlanta and the worship service with the homeless folks and Matthew Works. 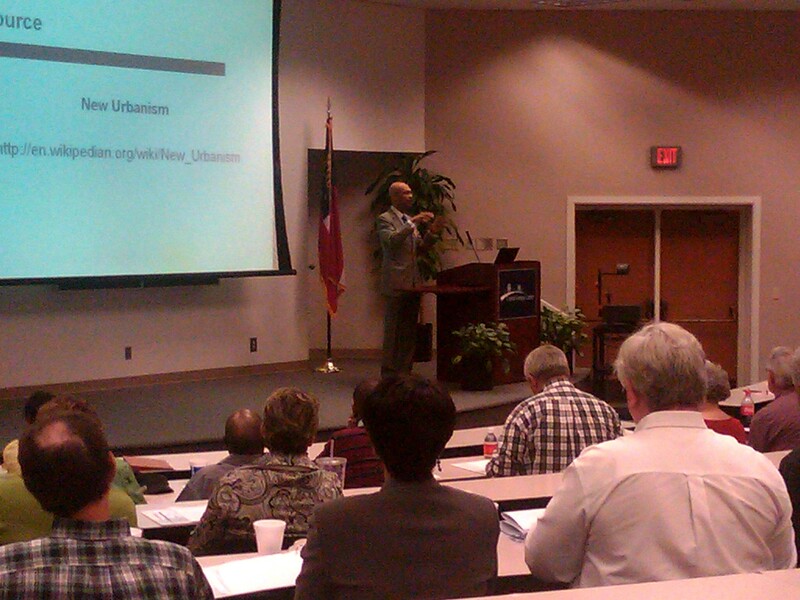 I was headed for Savannah to meet up with some wonderful leaders from various cities around the state of Georgia for another Georgia Initiative for Community Housing (GICH) retreat. GICH is a one of a kind program in the nation that helps communities build collaborations within their own area, but also helps them learn from the experiences of other munincipalities. Having a strategic plan and a collaborative mindset is esential in obtaining funding and then successfully executing any renewal effort. In the past 7 years 21 communities have "graduated" from the program which is a 3 year commitment. 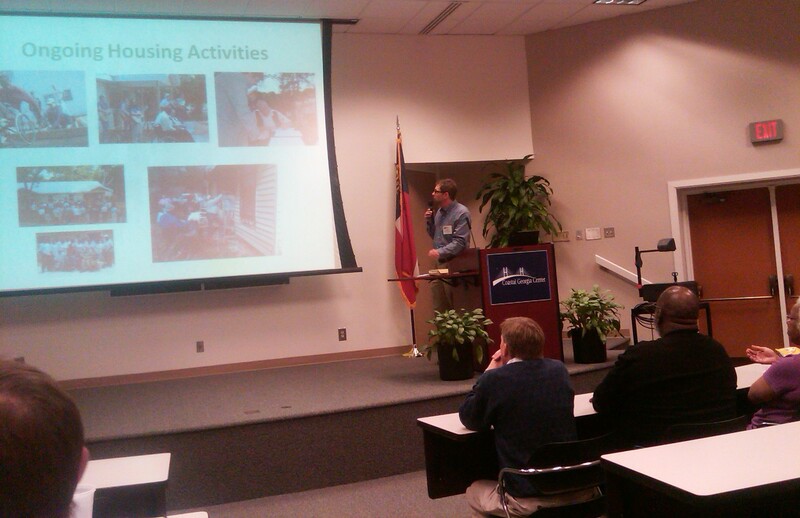 Our Americus-Sumter team has begun its sophmore year in the process and we came to report our progress. 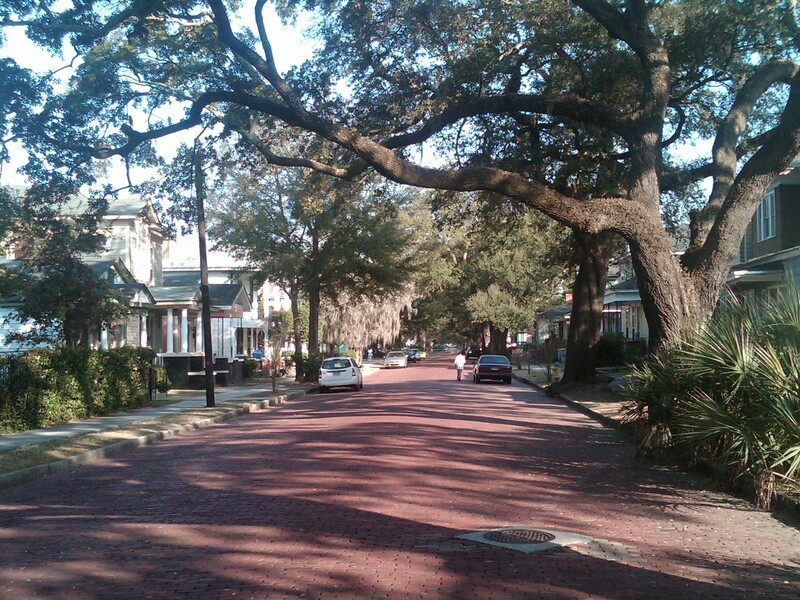 I rolled into town and enjoyed seeing the historic buildings and Live Oak trees with the Spanish Moss. It was a georgeous, warm day for February. 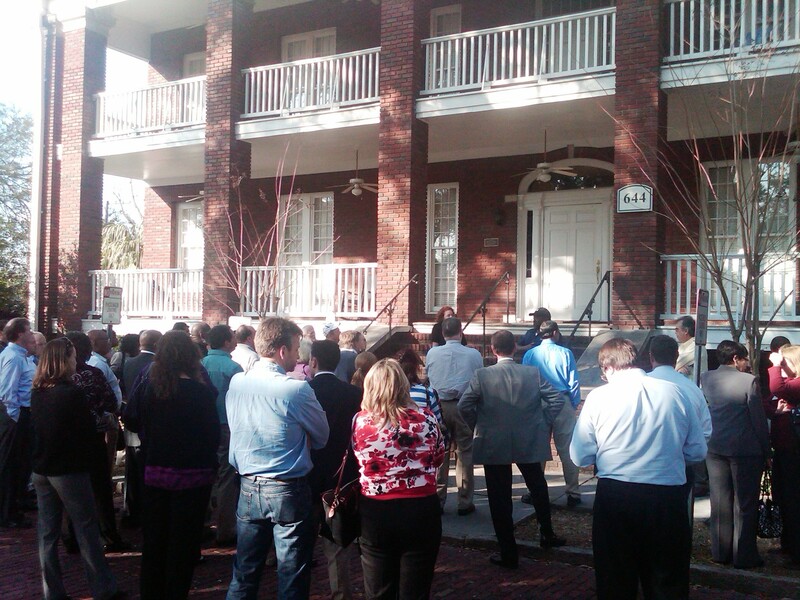 Our leaders from Americus arrived in this historic city with some history of our own to share. In the year 2000, a similar collaborative effort was completed in our area called "The Sumter County Inititave" a dream of Millard Fuller in 1992 to "explore the idea of eliminating shacks and substandard housing in the world by starting in our own county, Sumter County, Georgia where Habitat for Humanity was started in 1976." LeRoy Troyer, Chair of The Fuller Center for Housing board, was a Trustee for Habitat at the time when Millard pitched his idea to the board. He recalled, "Still sensing a lack of support he stood on the table in front of the full board of trustees and delcared that he just wanted to explore the idea with the Sumter County community leaders and citizenes." After a break, a motion was made for the Board to make it unanimous to allow Millard to explore this idea and it passed with rousing cheers. LeRoy recalled, "At this point Millard Fuller had everyone rise and hold hands and he led the Board of Trustees in a dance around the board tables in the conference room. He then concluded in prayer for the Holy Spirit to give guidance to this idea and to warm the hearts of the people to help fulfill this dream." On September 15, 2000, Millard’s vision was completed in Sumter County. 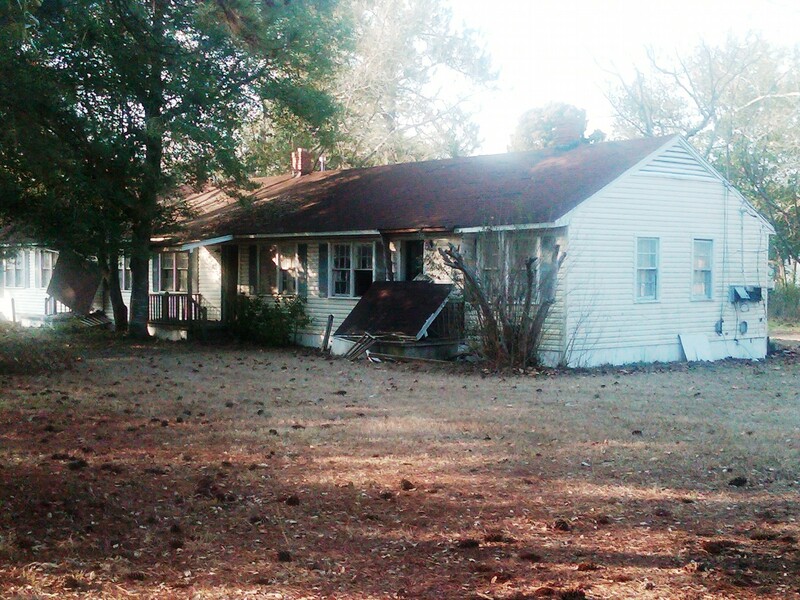 The last home was built in Plains, Georgia on land that President Carter farmed as a young boy. The house also marked the 100,001 Habitat for Humanity house built in some 95 nations around the globe. With that house, Sumter County became the first county in the United States to achieve this goal. LeRoy concluded his report on the accomplishment by writing, "It has been said that without God, we can’t and without us, He won’t." So 11 years later, our community finds itself again collaborating around the issue of housing. We had learned a much, but we began the process with the realization that we didn’t know what we didn’t know. So a $9,500 grant was written and we engaged the River Valley Regional Commission to do a drive-by survey of every house in Americus and in a two-mile radius around the city. 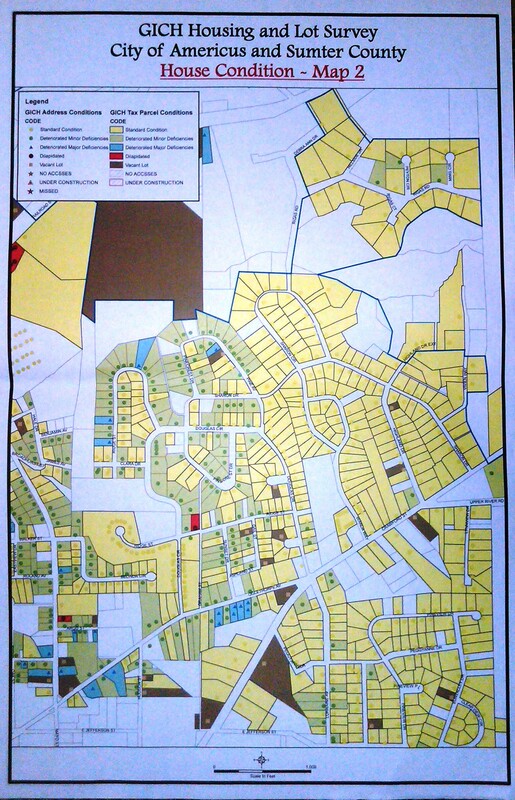 The houses were classified and then maped on a GIS system. On the map I’ve uploaded, the houses represented in yellow are in good shape. The ones represented by green are showing minor deteriation and in need of some repairs. The houses in red are dilapidated. We found 35 families living in dilapidated houses. After listening to Matthew Works the day before, I wonderd what their names were. What were their stories? The economy of Sumter County has changed only a little over the past 10 years. Some jobs were lost. Georgia Southwestern College and South Georgia Tech increased in size. There is a growing population of Hispanic families who have moved to the area. We certainly have witnessed that housing without ongoing maintenance can deteriorate. Sometimes very quickly. When it was my turn to help with our presentation, I shared with the audience that I often heard Millard say, "The accomplishment of the Sumter County Inititive and eliminating poverty housing is like eating a big meal. It doesn’t mean we can stop eating." He was convinced that the housing work was still needed, even in Sumter County. At the same time the drive-by surveys were being completed, the University of Georgia Housing and Demographics Research Center provided technical support by creating written surveys for roughly 10,000 citizens about their percieved housing needs. We will begin the process by understanding the current challenges, strategically requesting funding and engaging our community contractors, non-profits and volunteers, most of whom come from our two colleges and local churches. Tuesday morning, we were greeted by the mayor of the City of Savannah, Otis Johnson. He gave a fantastic lecture on visioning. He said the founders of the city had great vision and wisdom. The city was layed out very logically, in a way that encouraged pedestrian traffic, community and residential neighborhoods which had access to commerce and food. He observed that each house had a building out back that was used as a shop or an apartment. "The small house out back provided economic support for the big house out front." Unfortunately, during the 1980s, the city witnessed a growth period where he said the attitude was "anything goes." Planning was put by the wayside. Now they are trying to undo some of that craziness by being sensitive to their history and the lessons they can learn from it. I could tell Mayor Johnson loves his work. He is a big-picture visionary who can break the complex down to a simple, understandable statement. "Here’s our vision for our city," he said. "When I was growing up, my mama said to me as I was going out to play, "Don’t leave the neighborhood!" It was a safe place where everyone knew everyone." He said, "If me and my friends would go and cause some trouble, the neighbors would report it to my mother and Lord knows, I didn’t want what was waiting for me by the time I returned home!" There was that name thing again. I could sense a repeating theme. Marin Fretty, an archetect from the City of Savannah, gave us a wonderful introduction to all of the affordable housing activities going on in the area and his colleagues provided a bus tour to see things first-hand. 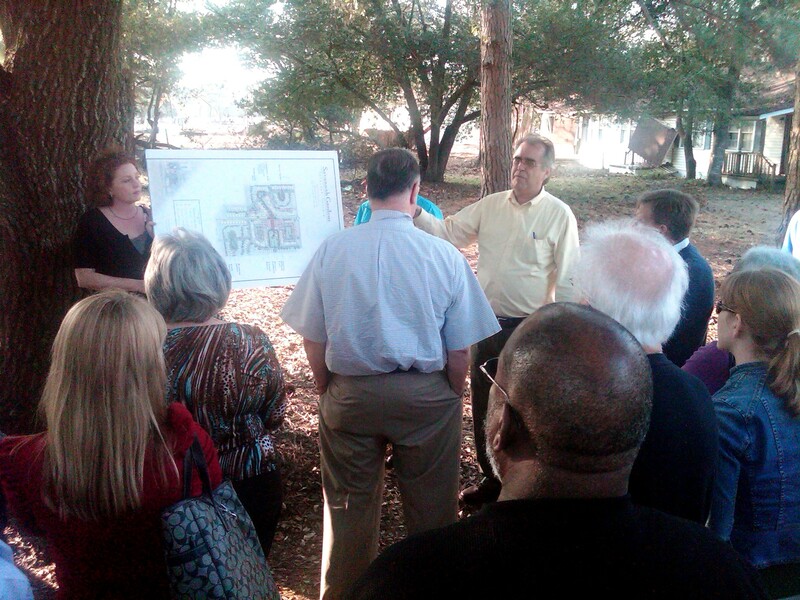 We visited a 44-acre former public housing site developed during WWII for shipyard workers. It must have really been somthing in its heyday. They told us that they built 750 units in only 6 months! Now they are spending $92,700,000 on acquisition, infrastructure and housing to tear down and rebuild the community. I was struck by the thought that we were driving by houses that were built when the city was founded and yet we also knew that housing built in the 1940’s was headed toward the landfill. What made the difference? Why were some cared for, protected by historical committeees, and others turned into the "housing of last resort," overrun by the poorest of the community, many surving only on the underground economy fueled by people struggling with lack of education and addictions? In addition to other housing efforts we visited, I enjoyed learning about an old hospital that was abandoned and gutted by fire. It was rehabilitated through a major public and private works project and had now been converted to an "Adaptive Reuse" building with 65 affordable rental units and attached multi-family infill housing units. We learned the history of the hospital. It was originally established in 1896 as a facility that would give opportunity for African Americans to receive healthcare services and a place where African American doctors and nurses could practice medicine. The brick building was built in 1931 by the Charity Hospital and continued to operate until 1964 when the Civil Rights movement created more equal access to health care. At that point the building became a nursing home until 1976. We have a similar building in Americus called "The Colored Hospital." The Colored Hospital building in Americus has also served many different purposes over the years. Currently it houses a food pantry that is collaboratively managed by our Sumter Area Ministerial Association. By 10:00 last evening, I made my way back home to Americus. As I drove past the Colored Hospital Building and our Fuller Center home office on Martin Luther King Boulevard I reflected on the last three days. Many people look down on the South. Many people look down on government bureaucrats. Many have a low opinion of churches. I see something different and more hopeful. In the South and all over the world, I see civil servants, volunteers and church missions who have stepped up to the challenge of Matthew 25 when the question was asked, "Lord, when did we see you hungry, sick and poor?" Decent housing for everyone is a righteous undertaking. The Lord is calling us. We have much work to do. We have many names to learn and stories to hear. Will you lend your name to this great movement?